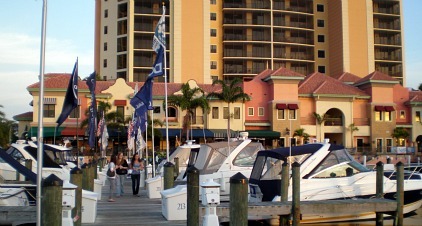 Cape Harbour is one of my most favorite places to go to and is one of the nicest of the Cape Coral, Florida marinas. You will find great shopping, dining, and lovely homes in this luxury yachting community. After shopping and dining, it is so nice to be able to take a stroll around the boats at the beautiful setting of the marina. 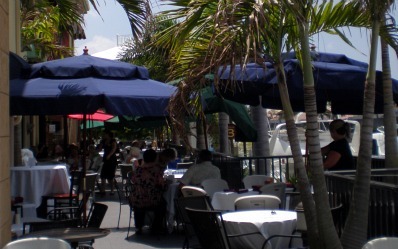 It is also one of the best places for Cape Coral boat rentals, fishing charters, and boating tours. The community is located at the southern end of Chiquita Boulevard. 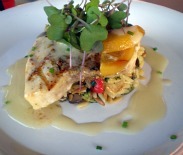 Some of the best restaurants in Cape Coral are here! And so are some of my favorite boutiques, fun holiday festivals and events, boat rentals, and charters for fishing or cruising. 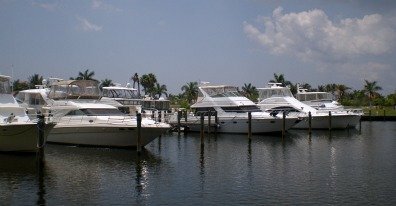 This yachting community also boasts luxury condominiums and waterfront homes on gulf access canals, the finest in Cape Coral real estate. 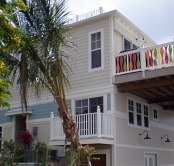 The latest homes being built are the Funky Fish Cottages that are in an "old Florida" style. Looking for something to do on the 4th of July, Cinco de Mayo, or New Years? 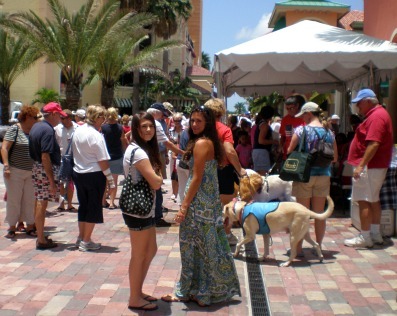 Cape Harbor is host to many festivals and fun holiday events, as well as other occasions. Live music plays weekly, either outside at the center stage area or at some of the restaurants. We think their 4th of July Great American Picnic is such a blast! 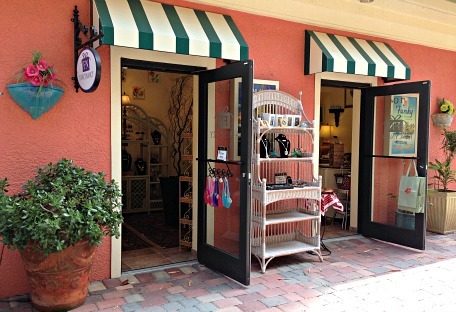 They have live music, food, sales at the stores, fun activities for kids, and a dog contest. When we are in the mood for some fine dining and we want to get dressed up, we like to go to Rumrunners. If the weather permits, we try to sit out side on the terrace so we can watch the boats coming and going. You can dock your boat right there at the back of the restaurant, and stop in for lunch or dinner. The food is very good, I love to get their seafood specials. The service is also very good. For more casual dining, we like to go to Fathoms. They have a terrific list of tapas for appetizers and that we sometimes like to get several of them for dinner to share. They have the best thin-crust pizzas - my favorite pizza in Cape Coral ........ salads, sandwiches, and a few nightly specials. 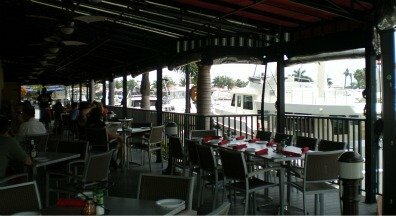 We also like to sit outside and enjoy the view of the marina and all the boats. If it's too hot though, we also like to sit in the cool restaurant where the decor matches the chic menu. 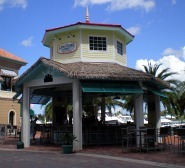 The other happening place at Cape Harbour is Fathom's outside bar under the big tiki hut right in the middle of the shopping area. You can order pizzas from Fathoms and listen to live music on Tuesday nights. It looks so nice with sparkly white lights decorating the palm trees. Go for the huge New Years Eve Party which features live music, dancing, and fireworks. 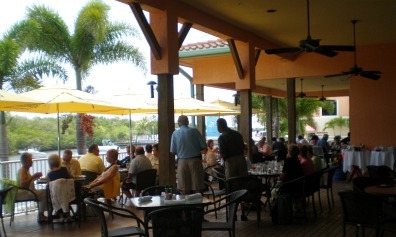 The Marina Club specializes in dishes from Argentina, dine inside or outside on the terrace and watch the boats. The French Press is a coffee shop where we go when we get a craving for gelato. I think it's Cape Coral's best place for this creamy and delicious Italian ice cream ...... coconut, mango, lemon, and raspberry are some of my favorites. My kids love the raspberry, chocolate flavors, and hazelnut best. We have a hard time deciding which flavors, so we always get 2 different flavors! You can get free samples to help you decide. Ask for the card where you get a free gelato after purchasing ten of them. You have the option of sitting inside or out at both places. 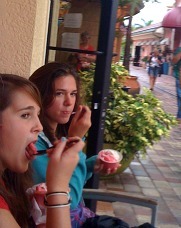 And ............. finish up that gelato so you can then go shopping! Islands has a nice selection of Florida lifestyle clothing: Tommy Bahamas, Crocs, and Fresh Produce. It's a good shop to get souvenirs and gift items. 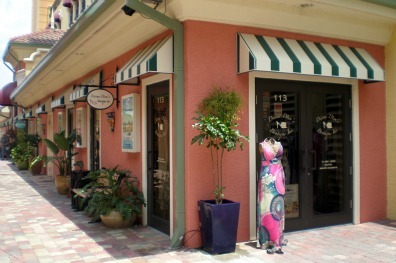 I like the Hawaiian prints on the clothes at Tropics and Paradise, another boutique that has clothing and accessories to get you in the Florida groove. Divine Divas Boutique has one-of-a-kind party clothes, they pride themselves in offering the best in personalized service. You can find unique gowns, flirty tops, and shoes. Harbour View Gallery features 7 award-winning artists on a regular basis, and 2 visiting artist each month. The artists work with watercolors, pottery, photography, glass, mixed media, paper casting and jewelry. The displays change frequently and public receptions are usually on the first Tuesday of the month between 6-8PM. 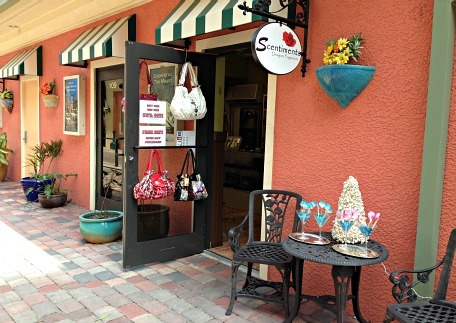 Get gifts, bags, fine fragrances, jewelry and more at Scentiments, Our Perfect Pantry, or Fancy Nancy. Other businesses include Cherie Clark Interior Design, High Maintenance Salon and Day Spa, Grand Banks Yachts, and Marine Max. To charter a boat for lunch or sunset cruises, and eco-tours, there is the Banana Bay Tour Company. Venture Out offers fishing charters of all kinds, from flats fishing to deep sea fishing. They are terrific and are our first choice when it comes to hiring a fishing charter. 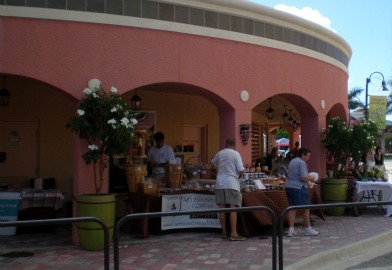 Check out the Cape Coral Farmers Market happening here during during the summer months for fresh, local produce, soaps, artisan breads, fresh seafood, and more. Now that you see all the great amenities here, I think it's time to live the dream and buy a beautiful Cape Harbour home! Most of the homes, except for the coach homes, are either on a canal, on the marina, or have amazing waterviews. You have several choices: luxury condos, coach homes, and family homes ......... condos are available for vacation rentals. Various amenities include pools and a clubhouse, and of course, the shopping, dining, entertainment, and marina. Either way, you have so many fun things to do, and they are all right there at Cape Harbour ..... one of Cape Coral's treasures. The first is a front view of the shops at Cape Harbour, and the second is a back view from the marina.